I'm very excited about this soon-to-be-released "Optical Alice" doll from Pullip. I absolutely adore her striped dress and checkered apron; striped stockings; shock of white hair; and soulful eyes. I have recently hired a personal organizer to get the clutter in my house under control, though, and she says I can't buy another doll until I figure out a better solution for my existing ones! Sheesh. 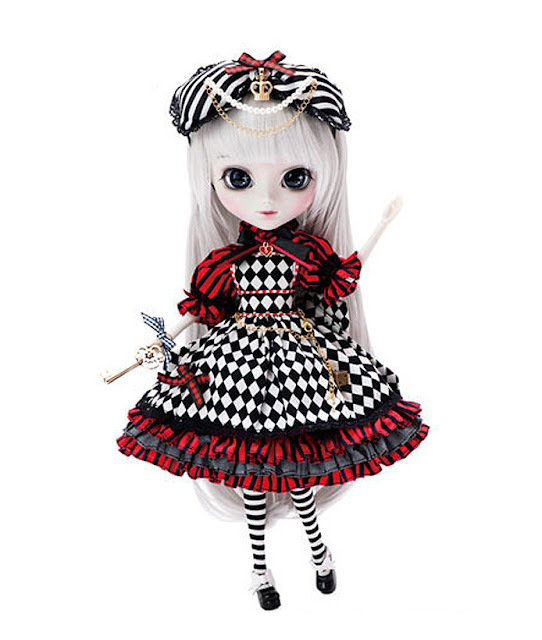 The Optical Alice Pullip doll is currently a pre-order on eBay and should be coming to Amazon later this month as well. You can read more about her on Pullips and Junk and on the Pullipia blog. Her face is absolutely ethereal! I love most of the Pullips, but I don't know where I would put them. she is adorable! thanks for sharing!